eTourismLab | 2016 Electronic Markets Papers of the Year goes to BU eTourism Lab! One more great publication – one more award! The paper: Neuhofer, B., Buhalis, D., Ladkin, A., 2015, Smart technologies for personalized experiences: a case study in the hospitality domain, Electronic Markets, Vol 25(3), pp. 243-254, has been selected as one of the two ‘2016 Electronic Markets Papers of the Year’. High quality papers are essential for an academic journal. The Editorial Board of Electronic Markets therefore wants to reward those, who submitted outstanding papers to our journal. All 21 papers published in Electronic Markets in 2015 were considered and downloads and citations in 2016 as well as a set of quality criteria were used to nominate the papers. 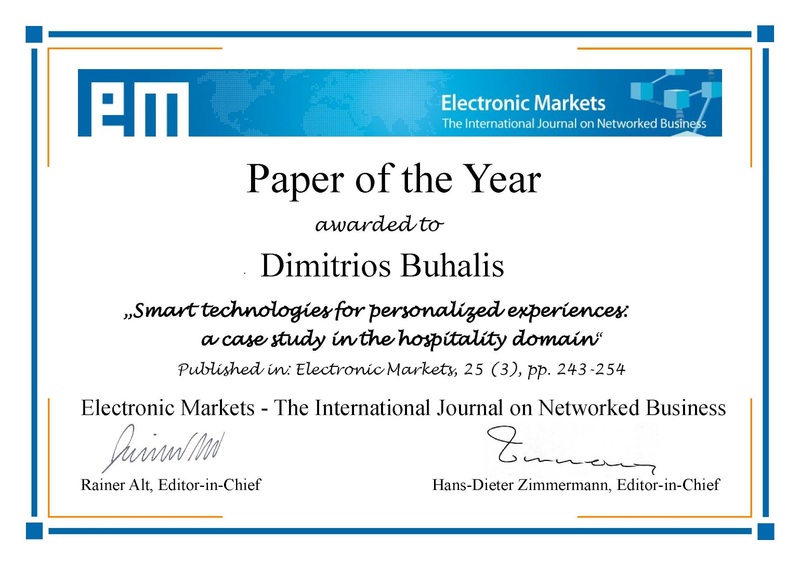 It is our honor to announce that your paper “Smart technologies for personalized experiences: a case study in the hospitality domain” published in our issue 25/3 has been selected as one of the two ‘2016 Electronic Markets Papers of the Year’. With this award, we would like to express our appreciation of your exceptional contribution to Electronic Markets. You will find your certificate as author of the Paper of the Year 2016 attached to this E-Mail. Furthermore, we will send you a high quality print via mail once you have provided your physical address. Congratulations! We are looking forward to working together with you in the future.